His first match in the World Cup was against the USSR in the first round of the 1958 FIFA World Cup. He was the youngest player of that tournament, and at the time the youngest ever to play in the World Cup. He scored his first World Cup goal against Wales in quarterfinals, the only goal of the match, to help Brazil advance to semifinals, while becoming the youngest ever World Cup goalscorer at 17 years and 239 days. 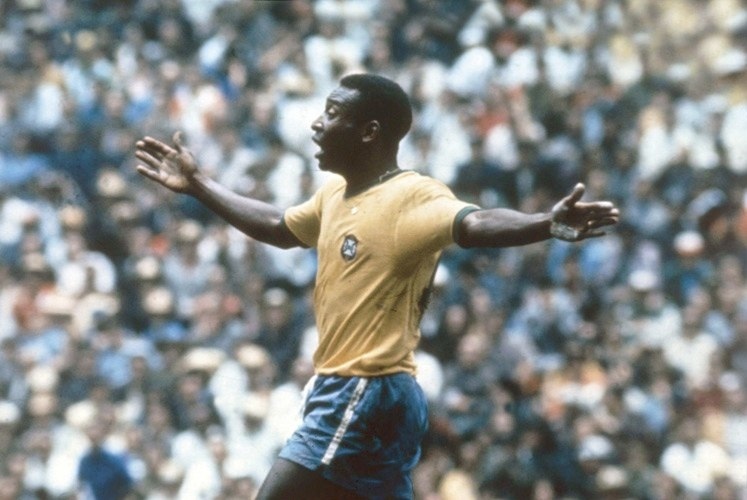 Against France in the semifinal, Brazil was leading 2–1 at halftime, and then Pelé scored a hat-trick, becoming the youngest in World Cup history to do so. On 19 June 1958 Pelé became the youngest player to play in a World Cup final match at 17 years and 249 days. He scored two goals in the final as Brazil beat Sweden 5–2. His first goal, a lob over a defender followed by a precise volley shot, was selected as one of the best goals in the history of the World Cup. When the match ended, he passed out on the field, and had to be attended by the medical staff. He then recovered, and was visibly compelled by the victory; in tears as he was being congratulated by his teammates. He finished the tournament with six goals in four matches played, tied for second place, behind record-breaker Just Fontaine.